Timeshock! 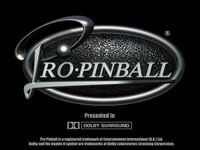 is a 1997 pinball computer game developed by Cunning Development and published by Empire Interactive. It is the second game in the Pro Pinball series, and is themed around the concept of time travel. The inclusion of a time machine fixture on the table facilitates the game's time travel theme. At any one time the player is in one of a handful of time zones, the main ones being: The Present Day, The Distant Future, Ancient Rome and The Prehistoric Age. Completion of certain objectives allows the player to travel between time zones (although some must be unlocked first, by means of completing secondary objectives). Source: Wikipedia, "Pro Pinball: Timeshock! ", available under the CC-BY-SA License.